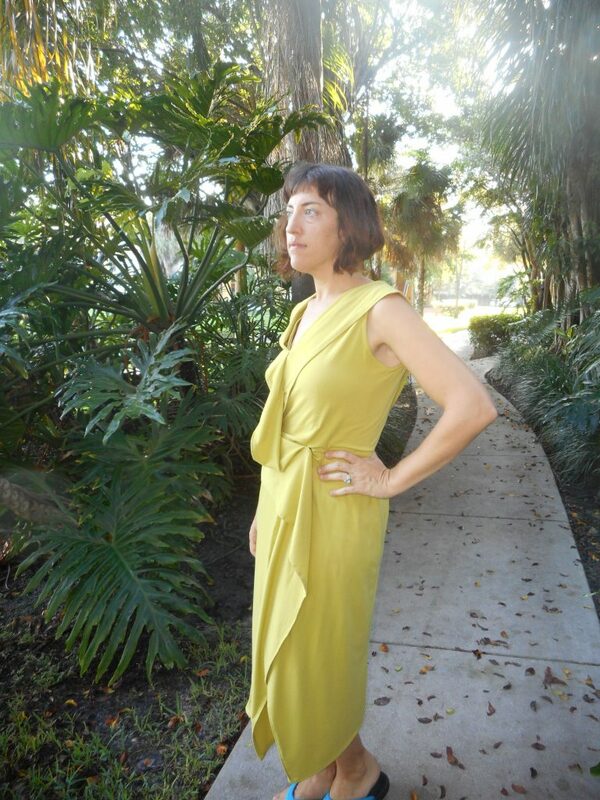 I’m feeling really on trend in my newest make, a beautiful chartreuse Donna Karan for Vogue Patterns, V1489. 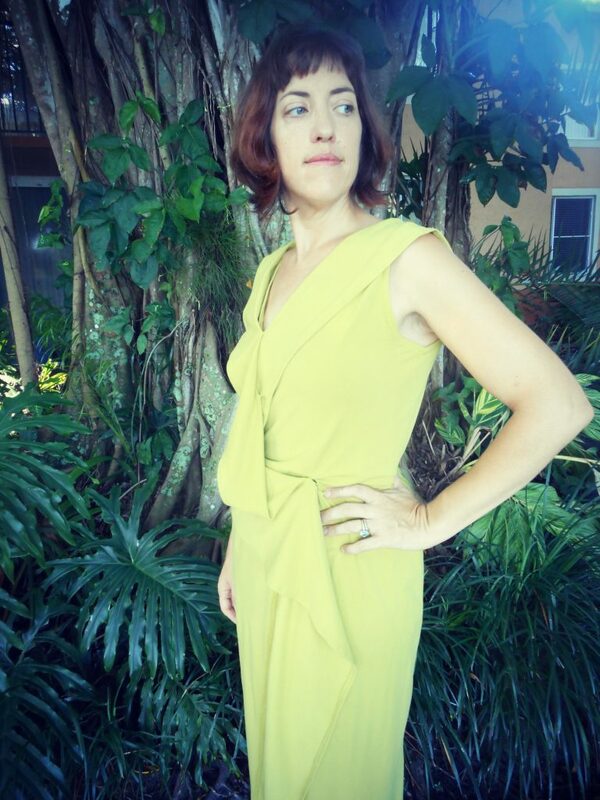 This dress was supposed to be my wearable muslin but it’s fabulous as is. 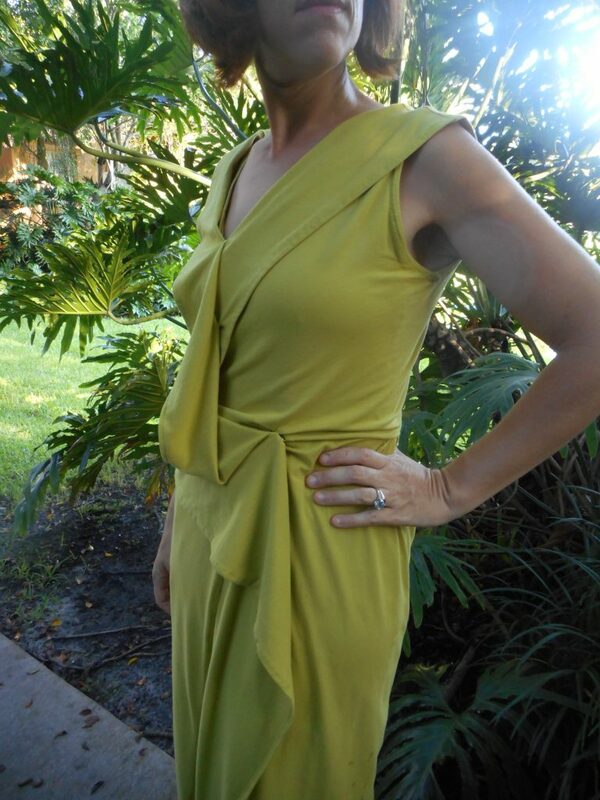 I wasn’t quite sure about the color until I put it on-but once I did –wow! This dress is a real stunner! I bought a bunch of Donna Karan patterns before they went out of print due to licensing and this one is a winner. It reminds me of an Issey Miyake pattern I got back in the 90’s. 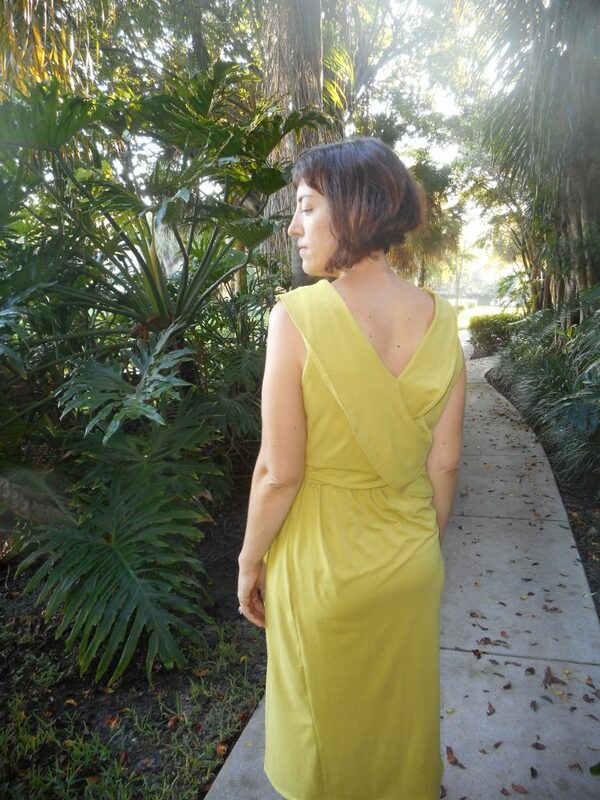 I love the front draping and the gathered back waist. Gorgeous silhouette. 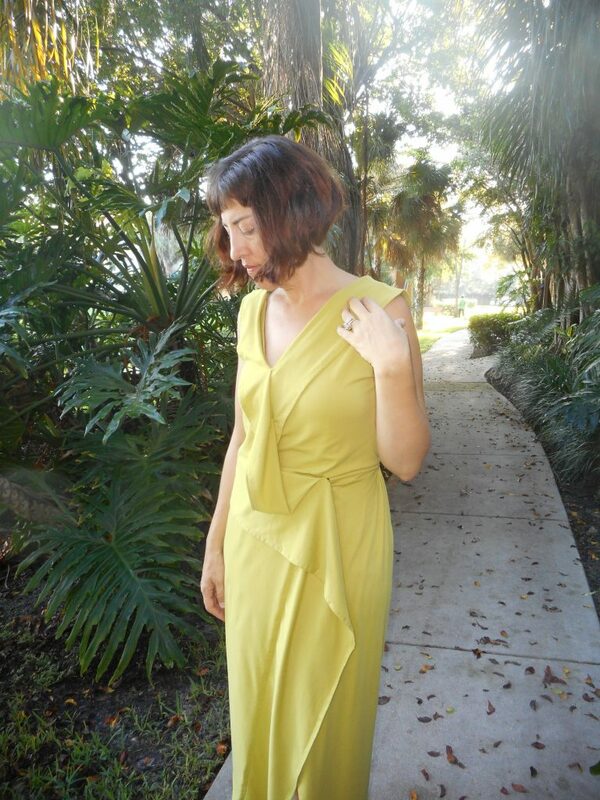 Bonus-I’ve again made a really uber-comfortable dress. Vogue V1489 Donna Karan Collection, size 10. Out of Print. This pattern’s sizing goes from 4-10 and then 12-18. Normally I wear a 12 in Vogue patterns but I knew from past experience that the knit ones tend to have more ease then I like so I purchased the smaller size range and cut this in a size 10. My measurements (which should put me in a 14-16): 37/29/39 and the Pattern in Size 10: 35.5/25/34.5. That left me with enough negative ease for this 4 way stretch knit. Vogue Designer Patterns are always really interesting to construct and learn new sewing methods. 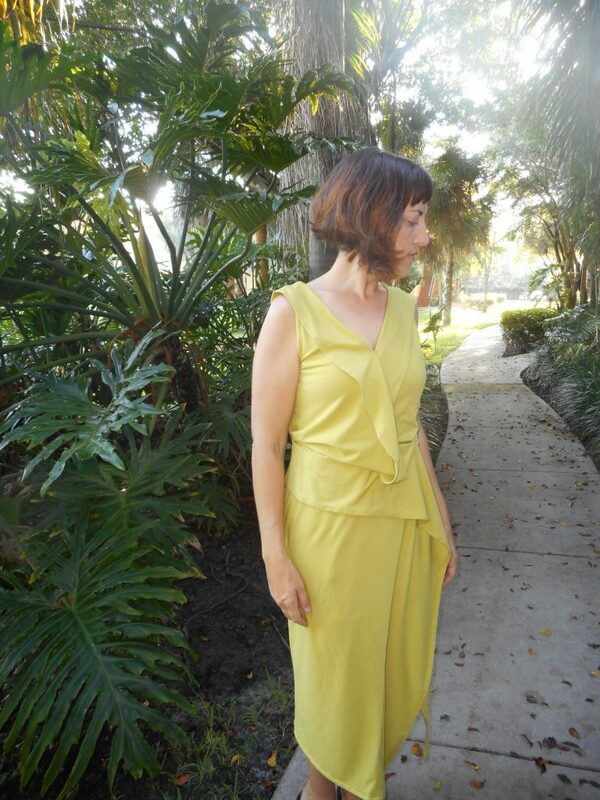 I love the way the draped collar/flounce is attached and pieced. 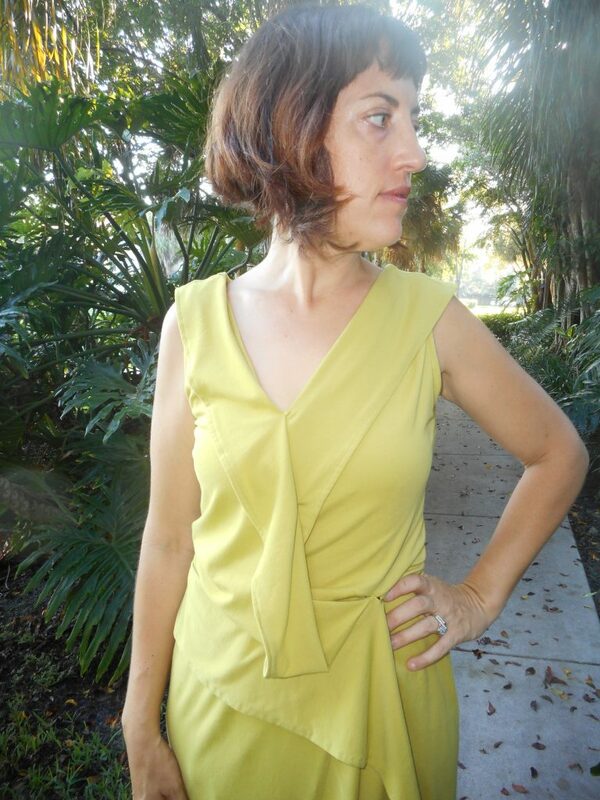 The dress closes with a snap which lets the folded collar drape over the waist. I got confused a few times sewing this up as the skirt is attached to the waist at the back with the bodice turned, but it all turned out beautifully. The front drape collars are sewn closed with tacks and the back neck as well. The skirt is 3 pieces that has ease built in to gather at the back waist. The dress has a full slip with darts built in underneath and then the dress wraps around and closes on the interior with two self ties. Next time I’ll make a few minor changes. 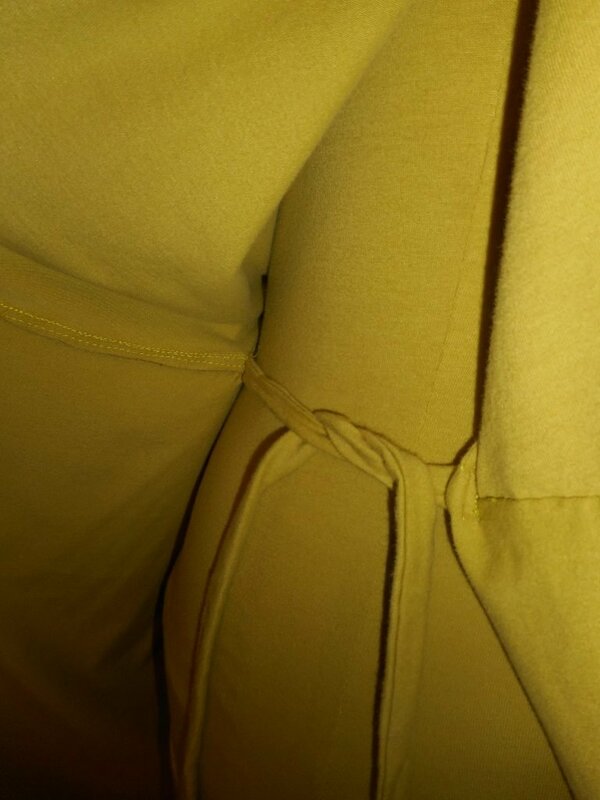 The underslip is sewn with folded under hems so I’ll add binding for a cleaner finish. Mine stretched a bit while sewing and is a bit messy at the V. I also was a bit short on fabric (The pattern calls for 4 yards (3 main and 1 lining) and I only had 3) so my slip is pieced together under the waist. I’d probably lengthen the slip a few inches as well for more coverage. If I can find a similar colored knit I may remake the underdress in the future. I’d like to try this pattern with a contrasting slip and a sheer mesh or lace patterned over dress. So many ideas! A spiral scarf in a sheer black and gold print (Shape Shape pattern) as a raffle item for our ASG Annual meeting. Finishing up some alterations for my sister Meg and making her a matching slip. I just got the coolest fabric from a local shop today, A to Z Fabrics in Lauderhill. It’s so nice being able to shop locally here! There’s so much more selection on this coast. I got a two colored stripe (mauve and dark brown on tan) wax print fabric with a nice crisp hand and sheen + a mauve lining for a Rue dress. I can’t wait to make this up! I got a few extra yards of the lining to start working on some bias draping. 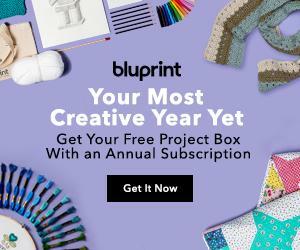 I got a free class from Craftsy (Thanks ASG!) so I’m taking the Bias Draping Class with Paul Gallo. It’s really fab so far! I’m learning so much. Preliminary plans for a Tailored Jacket with Frog Closures (Military Inspired Black and Gold) for my brother AJ. Preliminary plans for a Pirate/18th Century Coat for my Dad. Keeping busy while the kids are at school that’s for sure! I’m doing a ton of volunteering at the kids school too. I’m a room parent for Ami’s kinder class, helping out in the art room and working on the Meet The Masters art program. I had a few interviews and applied for some freelance sewing work but haven’t made any commitments yet. I’d really prefer to work for home but need a few more custom orders to finance/start my business. Everything’s still up in the air for now. Hope you all have a great week! Happy Sewing! This dress is awesome! 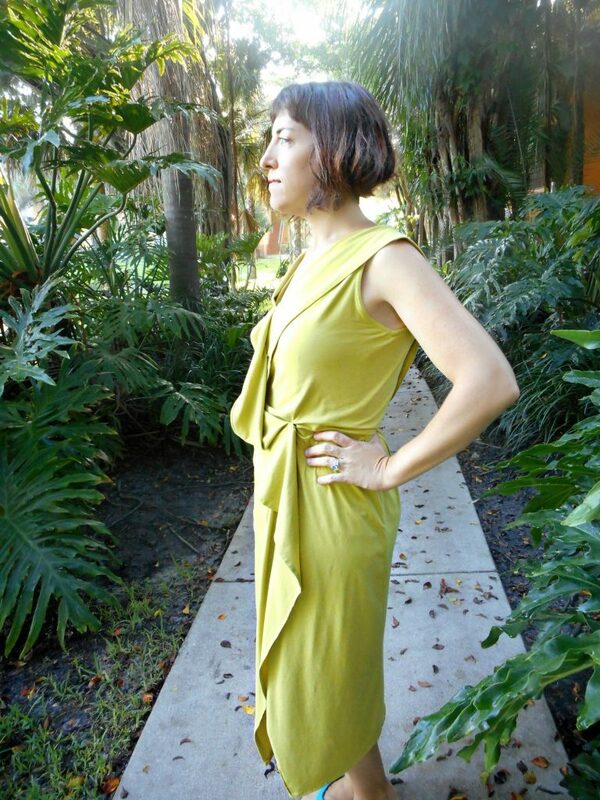 I love the interesting draping, color, and the flattering fit! You look absolutely stunning! Thanks so much! I think this is one of my fav makes yet- I just love how it drapes. This pattern really surprised me. If I’d seen your version, I might have bought the pattern before it went out of print! (Maybe the big belt hid all the cool style lines in the front?) Gorgeous dress. Thanks! I don’t know why they showed the pattern with that belt-it does hide the best part of the design! 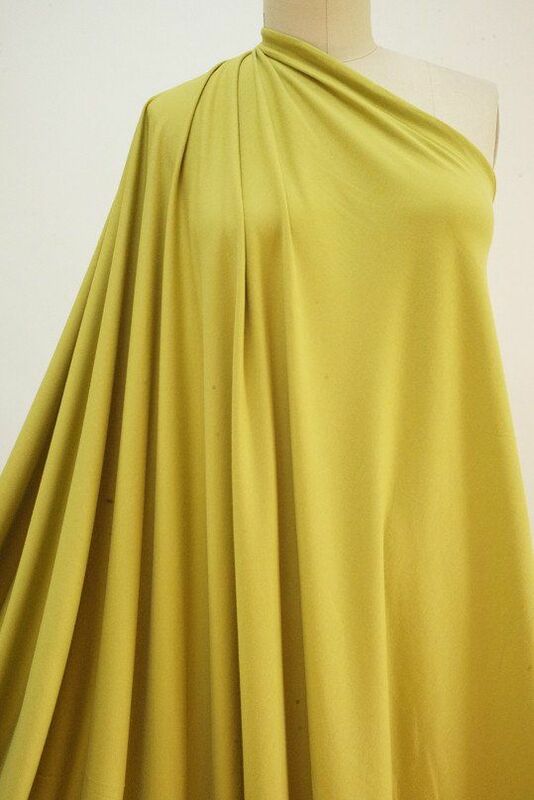 Plus the dark color on the model makes it really hard to see the drape. I’m so glad to see this made up. Like you I also stocked up on DK patterns before they disappeared and this was one of them. 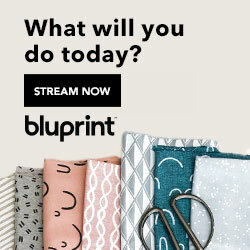 Your version is so much better than the pattern envelope – gorgeous! Thanks so much! I’m really glad I stocked up-DK patterns are always so interesting to sew up. 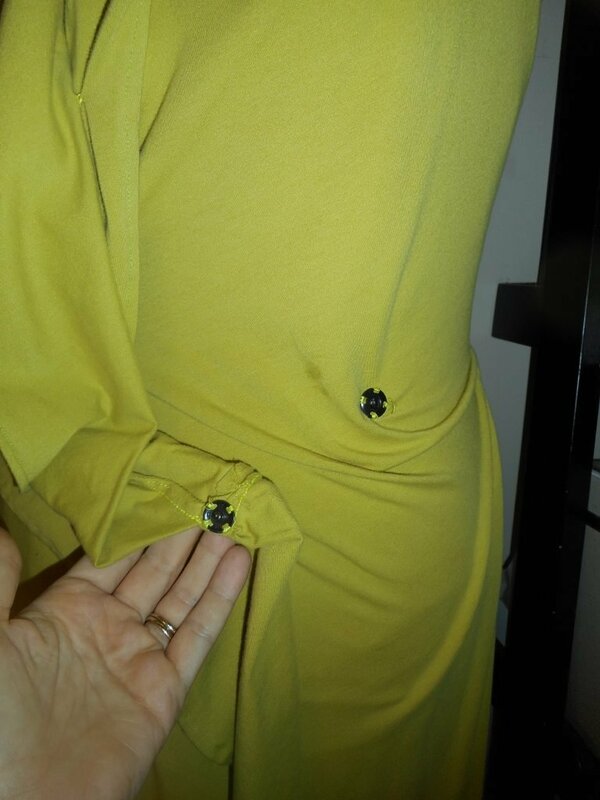 I was so surprised how pretty this dress turned out-the envelope image does it no favors. So glad I gave this pattern a go! Oh that’s gorgeous! I love the drapey bits at the front and that’s an amazing colour! Thanks Bea! I love this color too! It’s really a beautiful design. So good to see this made up and read about the construction. It looks sensational on you. Love the chartreuse too. I also rushed out to buy this pattern and look forward to trying it when summer arives.